Bruichladdich distillery is relaunching its heavily-peated Port Charlotte single malt whisky this May with a range of new expressions. The Islay distillery is set to introduce four new whiskies under the Port Charlotte brand: Port Charlotte 10, Islay Barley 2011, MRC:01, and MC:01. Each expression in the new range has been made from barley peated to 40ppm, and is presented in an opaque green glass bottle as ‘a nod to the heavily-peated Islay category’, with black labels. 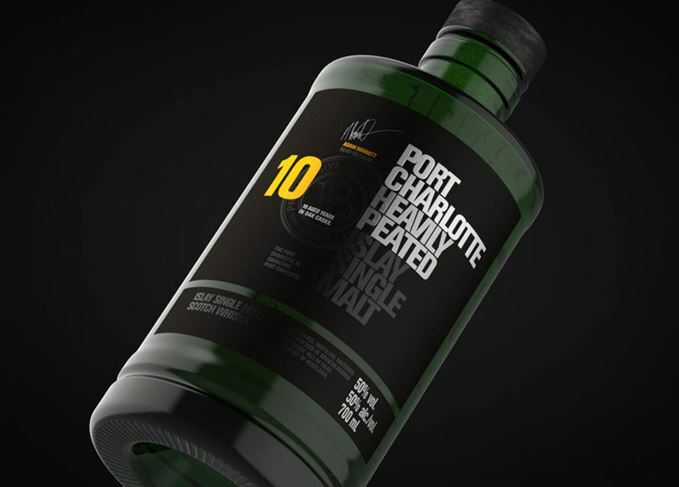 Port Charlotte 10-year-old marks the first permanent introduction of an aged-stated bottling in the brand’s history, and will replace the current multi-vintage Port Charlotte Scottish Barley. It will be available in domestic markets around the world, as well as in duty free for around £50 for a 70cl bottle, and is described as having smoky sweet notes of ‘coconut, vanilla custard, lemon honey, smoke oysters and sun baked salty sand’. Lastly, Port Charlotte MC:01 is a limited 2009 vintage matured in Marsala casks, which has been bottled at 56.3% abv and will be available in travel retail only. Its price is yet to be confirmed. Douglas Taylor, CEO of Bruichladdich distillery, said: ‘Our distillery project is built around certain key principles which drive everything we do. The authenticity, provenance and transparency of our spirit is paramount. Port Charlotte single malt is named after the nearby silent distillery of Port Charlotte, which ceased operation in 1929. Bruichladdich distillery first began distilling heavily peated malt for Port Charlotte whisky in 2001, with the first bottling – PC5 – released as a five-year-old malt in 2006. Port Charlotte Scottish Barley was introduced in 2013 under new owner Rémy Cointreau. It’s springtime in new whisky corner as two Bruichladdichs, three Glencadams and a Glen Moray arise.